Michael has been a speaker, consultant and marketing strategist for over 15 years. Currently, he is the founder and CEO of Social Web Tactics, a strategic marketing agency in the Metro Washington, DC region, Founding Partner and CEO of Government Contractors.co, CEO of Catoctin College, and Chief Marketing Officer for Ecofy / VOC coworking. Over his career, Michael has developed strategic marketing campaigns for fortune 500 companies, as well as defense contractors, and companies in media, technology, health care, cannabis and education. He has served as a CMO for a cannabis technology start-up. 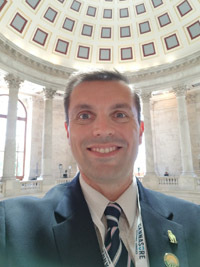 He started working in federal and state government relations in 1998, working on Capitol Hill and later for retail and recreational boating associations. Later, Hackmer managed industry affairs and association membership for non-profits, before taking on marketing roles for technology companies and in higher education. Michael is originally from Concord, MA, but lives in Virginia with his wife and youngest daughter.